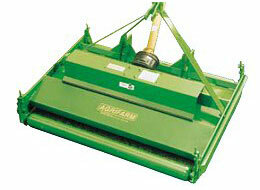 Robust finishing mower for parks, ovals and turf farms. Front and rear full width height rollers. 6 series drive shaft with friction clutch. High blade tip speed – for cleaner cutting. Spring steel blade beam with pivoting blades. 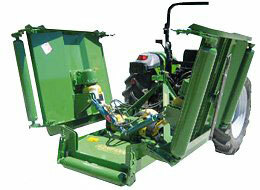 Three body section finishing mower designed to float independently on height rollers and follow the ground contour. Suitable for mowing large areas, ie parks, ovals and turf farms. All gearbox and shaft drive. High ratio gearboxes produce optimum blade tip speed for excellent cut finish. 6 series input drive shaft inc. friction clutch, 6 series outer shafts. Front and rear height rollers on each section – screw adjustable. Monocoque welded body sections for added strength and easy clean. Hydraulically raised wings to a transport width of 2450mm. Spring steel blade beams with pivoting blades. High speed pasture topper to clean up uneven pastures. High clearance body to reduce power requirements. High ratio gearboxes produce optimum blade tip speed.